FYI, so far I mainly plan to ask about water quality monitoring: the need for more of it, more frequently, and published more quickly, so as to find out when our rivers are clean and when they are not, and to help find the sources of contamination so we can all do something about them. While it would be convenient if Valdosta were the only culprit, it’s not. I applaud the dozen Florida counties of the Rivers Task Force for their recent meeting with Valdosta as a good start. So far, from my reading of Florida rules, it appears that all our rivers in Florida are already classified as Recreational by default. This makes our task in Florida easier than in Georgia, where we are asking to upgrade all our rivers and major swamps and lakes from Fishing to Recreational. But we need improved water quality monitoring so we can tell when standards are being met and when they are not. Specifically, we are meeting from noon to 2PM Monday in Orlando with Tom Frick, Director, Environmental Assessment and Restoration, Department of Environmental Protection. Some of you may recall he spoke at the March 20, 2019 meeting of the Florida Senate Committee on Environment and Natural Resources. According to recent correspondence, there are new developments in FDEP water quality monitoring since then. I will report back after Monday. This Monday meeting is not a public meeting, but there are public meetings about the Triennial Review coming up in May; see below. Found in Florida Rule 62-302.530 is Rule: 62-302.200, which announces the 2019 Florida Triennial Review. It includes schedules for three public meetings, on 14, 15, and 16 May 2019, in Tallahassee (Leon County), in Hobe Sound (Martin County), and in Orlando (Orange County). FDEP also lists those meetings in a Water Quality Standards Meeting Calendar. I’ve collected a bit more information on the WWALS website. PURPOSE AND EFFECT: As required by the Federal Clean Water Act, the Department of Environmental Protection (Department) is initiating the Triennial Review of state surface water quality standards. 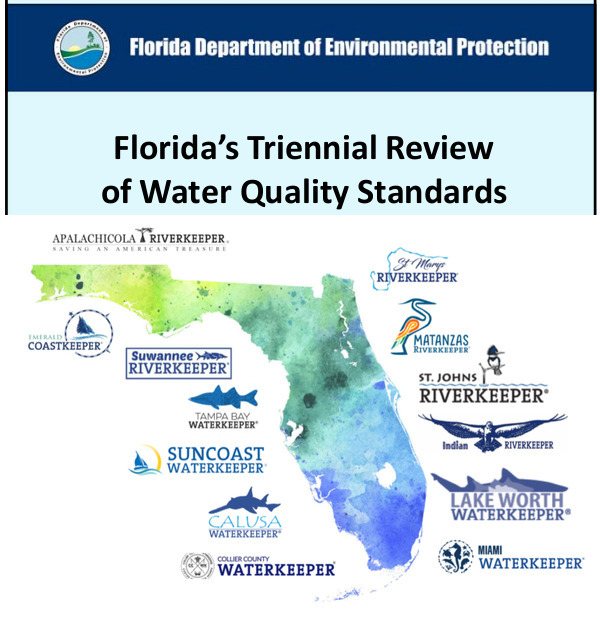 All surface water quality standards in Chapter 62-4, Chapter 62-302, Chapter 62-303, and Chapter 62-304, F.A.C., are under review and may be revised as part of the Triennial Review. SUBJECT AREA TO BE ADDRESSED: The Department will consider amendments to all surface water quality standards, including those within Chapter 62-302, F.A.C. (there are separate notices for Chapters 62-4, 62-302, 62-303, and 62-304, F.A.C.). LAW IMPLEMENTED: 373.016, 373.026, 373.414, 373.4592, 403.021, 403.021(11), 403.031, 403.061, 403.062, 403.067, 403.085, 403.086, 403.087, 403.088, 403.101, 403.141, 403.161, 403.182, 403.201 403.502, 403.504, 403.702, 403.708, 403.802 FS. DATE AND TIME: Wednesday, May 15, 2019, 9:00 a.m. DATE AND TIME: Thursday, May 16, 2019, 9:00 a.m.
Pursuant to the provisions of the Americans with Disabilities Act, any person requiring special accommodations to participate in this workshop/hearing is asked to advise the agency at least 5 days before the workshop/hearing by contacting: Kaitlyn Sutton at (850)245-8819. If you are hearing or speech impaired, please contact the agency using the Florida Relay Service, 1(800)955-8771 (TDD) or 1(800)955-8770 (Voice). THE PERSON TO BE CONTACTED REGARDING THE PROPOSED RULE DEVELOPMENT AND A COPY OF THE PRELIMINARY DRAFT, IF AVAILABLE, IS: Kaitlyn Sutton, Water Quality Standards Program, Florida Department of Environmental Protection, 2600 Blair Stone Road, MS 6511, Tallahassee, FL 32399-2400; telephone (850)245-8819, email Kaitlyn.Sutton@dep.state.fl.us.